(update) Even More Shows with Comedy's Favorite Duo! The Martin and Lewis Show was the first time that the world had a real taste of the comedic dynamic duo, composed of the venerable Dean Martin and the wacky Jerry Lewis. When Dean and Jerry met, Dean had been trying to make it big as a crooner for over ten years. Jerry, coming from vaudeville parents, naturally wanted to be a performer since he was a wee one. When they were both in their 20s, the boys were introduced by friends in New York City and began performing together. Each helped smooth out the others rough edges. Dino helped Jerry relax on stage, and Jerry helped bring out Dino's comedic side. The duo performed at nightclubs for several years. They were working their way through the big clubs when NBC announced a talent hunt. They were looking for rising young performers for television and radio. Some of the Network executives caught a nightclub act of Martin and Lewis. They were instantly won over by their chemistry. They tried them on television, but radio was a more popular venue, so they moved them on over and made plans for The Martin & Lewis Show. 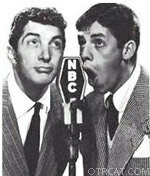 Martin and Lewis made promotional appearances on various programs prior to the air of their own show. After recording their audition show on December 21, 1948, guest starring Lucille Ball (there are two versions, the edited and unedited), they made their rounds. 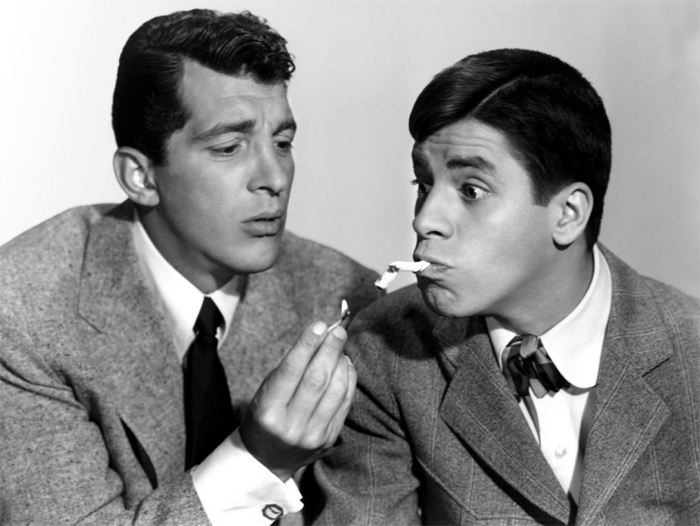 With only a little over three months before The Martin & Lewis Show aired, they began with an appearance on a March of Dimes Special on January 31, 1949. Then, in February they appeared on Chesterfield Supper Club, Sealtest Variety Theatre, and The Bob Hope Show. 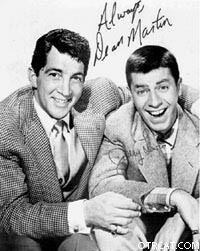 The Martin & Lewis Show went on the air on April 3, 1949, still searching for a sponsor. The network spent $10,000 per show, paying each star $1,000 a week. After a riotous movie and further difficulty finding a radio sponsor for their show, The Martin & Lewis Show went off the air after broadcasting what they thought was their last old time radio show on January 30, 1950. However, they couldn't keep these two down for long, because they were rip roaring and ready to go on another self-titled radio program just over a year later. Meanwhile, they gained popularity with their appearances on The Colgate Comedy Hour and The Big Show. With all these appearances, they used up a lot of their new material, and so tried to do fewer shows until they could come up with some more laughs. But Martin and Lewis were in-demand and so instead of doing less, they were asked to create The Dean Martin and Jerry Lewis Show. Their new show premiered on October 5, 1951. Dinah Shore guest starred on their first program, and try as she might, she couldn't't keep herself from busting up with laughter during the live performance. "A Streetcar Named Max, a take-off of "A Streetcar Named Desire was just too much for poor Dinah. Variety Magazine described this show as "one of the most hilarious 30 minutes in radio." The show consisted of an opening song and dance by Dean Martin, followed by some verbal slapstick, a guest spot by a distinguished Hollywood star, a lot of Jerry Lewis high jinx, and then a closing number by Martin. The radio series ran for a few years, but its star power could not be held by radio and it soon leapt to the new media of television. The broadcasts starred many A-list guest stars including Jane Russell, Joan Davis, Vic Damone, Gordon MacRae, Rhonda Fleming and many more. This collection features both of Martin and Lewis' old time radio shows, The Martin & Lewis Show and The Dean Martin and Jerry Lewis Show. Also included are Martin and Lewis' guest appearances on The Big Show, Bing Crosby, the music program Guard Sessions and others. And if that weren't enough to keep you laughing for weeks, there are also some outtakes and bloopers from their radio promos and live shows, as well as an unedited recording session of their crazy antics. See also: The Rat Pack Collection. Be the first to comment on "Martin and Lewis"